“TOP DEAWER" to be held in London. We will be waiting for many visitors' coming there. "Maison & objet" to be held in Paris. It will be exhibited 「MESSAGE FLOWER VASE」・「% PERCENT」・「TSUKI」・「UFO」・「HOUSE」in the international trade fair "NY NOW" of the United States (New York). of the United States (New York). 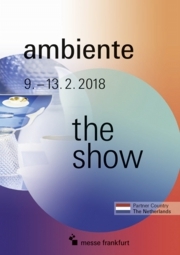 It will be exhibited 「PERCENT」in the international trade fair “ambiente" of the Frankfurt (Germany). We will announce many new colors at agency booth. It will be exhibited 「TSUKI」 in the international trade fair "NY NOW" of the United States (New York). “HOMI" to be held in Milan.